The universal popularity of the roulette game results in the development of a whole set of roulette secrets - different tips and recommendations for a player to reach success in this game of mere chance. Beside serious recommendations helping the player grasp the general system of roulette there emerged a system of beliefs that have nothing to do with reason and logics. These are the roulette myths and superstitions. One of the most popular myths connected with roulette is that the result of each game depends on previous results. It means that if for example a certain color has come out several times running, the player should bet on another color. The previous fallacy is connected with the rule of 'sleeping' numbers according to which numbers that have not come out for quite some time are likely to come out next. A lot of players stick to these roulette secrets and eventually they may win. But the chances they will win betting on a certain color are actually even, just as the chances a certain number will come out are one out of 36. There can be no record of previous game results in the roulette. Every spin of the wheel is seen as a unique event, and the chances of the players depend on mere luck. According to another myth, all roulette wheels are basically the same. In fact, they are not. The construction of European and American roulette wheels differs according to the number of slots. The European model has only one zero slot, which offers better odds to the players, whereas the American wheel has two zero slots - '0' and '00'. It should also be noted that no mathematical system can help a player win in the roulette. 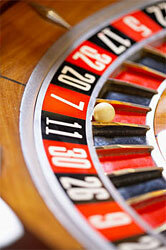 As it was already mentioned above, roulette is a game of chance, and each spin of the wheel is random by its nature. That is why applying any systems to the roulette casino game is simply a waste of time. Apart from myths, a lot of players are prone to different superstitions of all sorts. Superstitions rely on the irrational instead of facts and logics. For example, instead of making considered decisions the players may simply bet on the numbers they consider lucky, or on colors that were the first to attract their attention. Other players may even use certain 'magic' items that they hope will help them win the game, like rabbit feet or four-leaf clover. Of course, relying on luck may in some way help a player be more concentrated on the game process compared to the players who come to the casino certain of a failure. At the same time, to be successful a player must get acquainted with some roulette secrets based on logically and experimentally proven facts. First of all, it is better to avoid playing American roulette. As the American roulette wheel has two zero slots - '0' and '00' - it has higher house edge (the advantage of the casino over the players). While the house edge in a single-zero European roulette makes only about 2.7%, it is about 5.3% in the American variant. Another recommendation is to make outside bets rather than inside ones. Betting on Black the player has exactly 50% chance to win, while the possibility of winning with a Straight bet on an exact number makes 36 to 1. No matter what you rely on - either logical facts or myths and superstitions - the best advice while playing roulette is concentrate, manage your funds responsibly and enjoy the game.